This week marks the anniversary of the Great Fire of Rome, one of the worst disasters ever to hit the city of Rome. This tragic event took place during the reign of Nero in 64 A.D. The fire began in the merchant area of the city near the Circus Maximus and rapidly spread through the dry, wooden structures of the Imperial City. According to Tacitus, the fire burned for six days and seven nights. Only four of the fourteen districts of Rome escaped the fire; three districts were completely destroyed and the other seven suffered serious damage. Despite his efforts to quell the blaze and rebuild the city, rumors accusing Nero soon arose. It was believed that the Emperor had ordered the torching of the city so that he could rebuild Rome to his liking. The ancient sources carry conflicting accounts of whether the fire was started deliberately or was an accident. Suetonius and Cassius Dio point the finger at Nero as the culprit, burning the city in order to construct a new Imperial palace, whilst Tacitus says that an obscure new religious sect called the Christians confessed to causing the blaze. 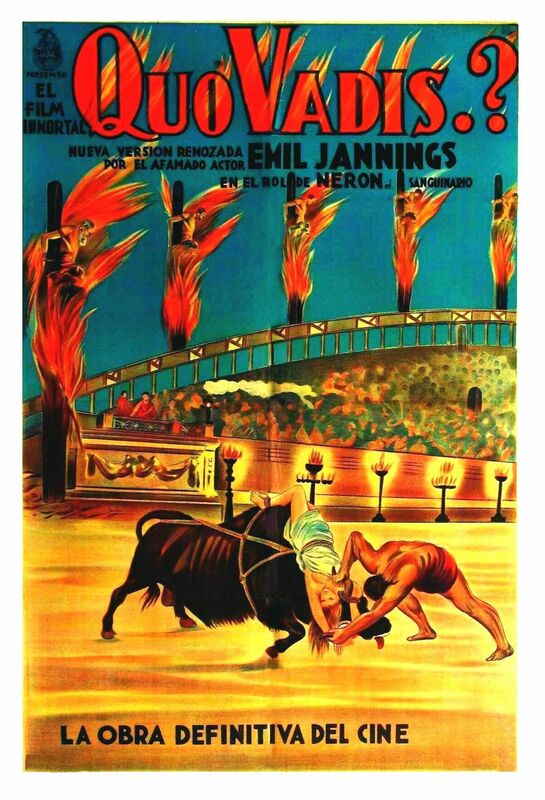 To make matter worse, Cassius Dio tells us that Nero sang the “Sack of Ilium” in stage costume as the city burned. 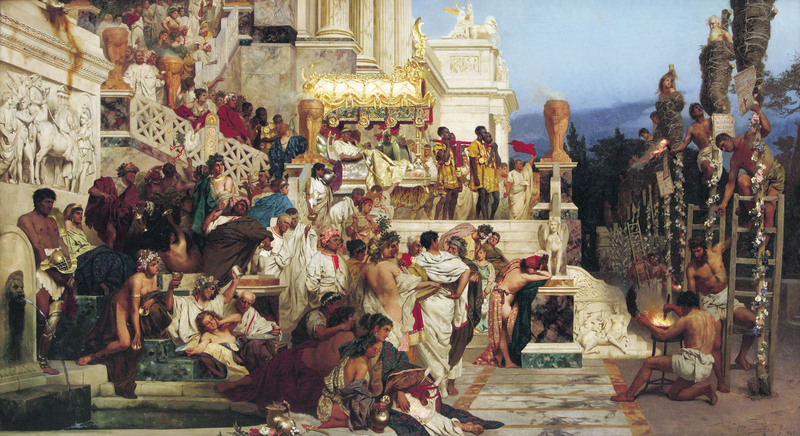 Nero himself blamed the fire on the Christians and, according to Tacitus, ordered them to be thrown to dogs, while others were crucified or burned to serve as lights. For the general public of the 20th century it was the Polish writer Henryk Sienkiewicz (Nobel prize in literature in 1905) rather than Roman historians who had the biggest influence in shaping Nero’s terrible reputation. His book « Quo Vadis », relating Nero’s reign and the fire of Rome, was published in 1896 and soon gained international renown (the writer used the figure of Nero to condemn the actions of the Russian Tsar Alexander II towards Poland and the Polish Catholic Church some 20 years before the publication of his book). Excited by new archeological discoveries made in Rome since 1870, Sienkiewicz is telling the story of early Christianity in Rome, with protagonists struggling against the Emperor Nero’s regime. While using the writings of Tacitus, Suetonius and Dion Cassius as a source for his story, Sienkiewicz tends to exaggerate every aspects of Nero’s personality and actions. He appears as a cruel, infantile, crazy and perverted individual. The book also designates Nero as the sole culprit for the burning of Rome. It was this fictional Nero who became an endless source of inspiration for the cinematographers who brought the infamous Emperor to the screen. 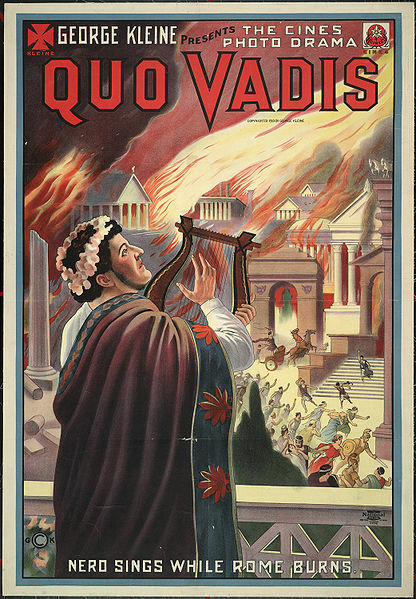 “George Kleine presents Quo Vadis Nero sings while Rome burns.” Chromolithograph, motion picture poster for 1912 film. The novel was adapted several time in more or less faithful versions. The most famous version featuring Peter Ustinov was released to public acclaim in 1951. Several other movies, though not direct adaptations of “Quo Vadis”, also relied heavily on Sienkiewicz’s writings to represent Nero.